$30,000 price reduction on this beautiful used Grand Alaskan yacht for sale! : Atlantic Yacht & Ship, Inc.
$30,000 price reduction on this beautiful used Grand Alaskan yacht for sale! If you are in the market for an used Grand Alaskan yacht for sale in Florida then be sure to contact Dennis Rhodes today! In the first place, this 60′ Grand Alaskan is located in Fort Lauderdale, Florida. Overall this is an extremely well equipped long range cruiser. Furthermore, this knowledgeable owner has continually upgraded her. Moreover, this vessel has only become available for sale due to a change in Owner’s plans. Similarly, this beautiful used Grand Alaskan yacht has enjoyed extensive upgrades from 2010 through 2012. In brief, be sure to put this Grand Alaskan trawler yacht at the top of your list! As can be seen, entering through the double doors off the aft deck puts you into the spacious saloon. Additionally, this area has built-in seating and a nice entertainment center. Including a Panasonic Flat Screen (installed in 2010). Further forward you will find yourself inside the galley with a pass through bar and ample storage. One particularly nice feature is the main deck day head off of the saloon. Another nice feature is that the engine room can be accessed from the lazarrette as well as the master stateroom. You can walk from the aft deck through to the engine room and out into the master stateroom. In addition you have two more staterooms forward and a functional fly bridge deck. 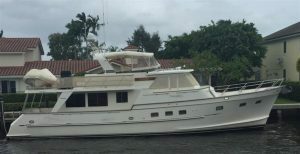 For more information on this used Grand Alaskan yacht for sale in Florida be sure to contact Dennis Rhodes today! Check out this 60′ Grand Alaskan at Riviera Beach TrawlerFest! $20,000 price reduction on this 60′ Grand Alaskan yacht for sale!